That's a lot of money, isn't it? You could buy a used car in cash if you had that much money. You could put a down payment on a pretty nice home in Wilmington. You could travel halfway around the world. Or you could pay off all your credit card debt. That's what Nathan and I did, just as the new year began. 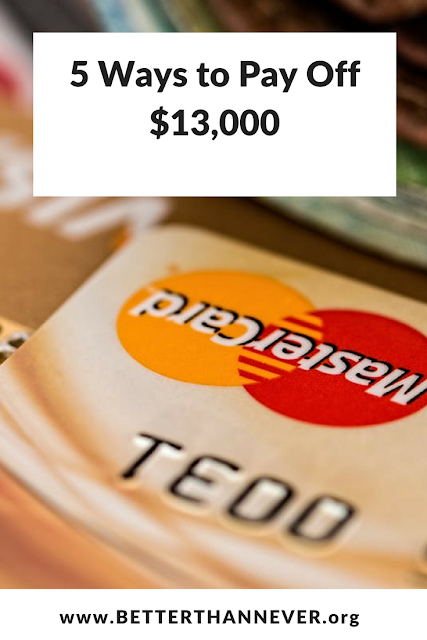 $13,185. We'd been carrying around that balance, or close to it, for about four years. We stopped using our credit cards two years ago, and we paid more than the minimum owed every month, but that balance still wouldn't budge. It was incredibly frustrating and demoralizing. Whenever you make a credit card payment - especially toward a balance you've been paying for YEARS - you're spending the money you make today on choices you made in the past. Trips you've already taken, food you've already eaten, clothes you might not even own anymore. Forget frustrating. It feels downright shameful. Every year, we resolved to pay off our credit card debt. Every year, we failed. Then, last May, we started using YNAB, a budgeting app whose praises I've sung again and again. Once I set everything up and finally entered our credit card balances, we were forced to confront the truth. Seeing those angry red numbers wasn't pretty, but we committed to getting rid of them, once and for all. We wanted to reach our goal by the end of the 2016, and while we missed that deadline by four days, we still felt pretty damn successful. 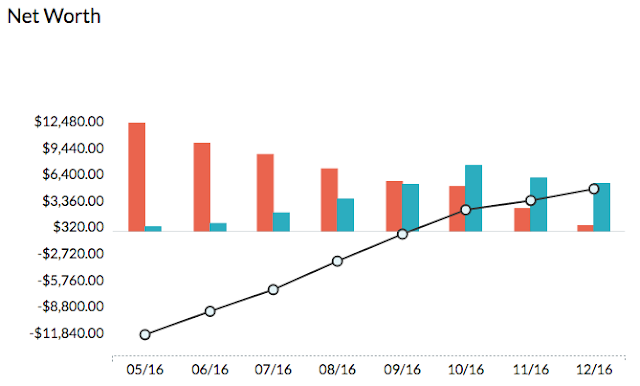 Thanks for the handy graph, YNAB! In addition to paying off all that debt, we reached a few other financial milestones in 2016. We saved up an emergency fund. We visited friends in Rhode Island and only spent money we'd earmarked in advance. We set aside money each month for the holidays and didn't overspend on any festivities. We saved up a decent down payment and bought a used truck from Nathan's parents. Best of all, we still managed to have a good social life full of small luxuries, such as hanging out with our friends, visiting the local breweries, working out at the YMCA, and lots of beach days. We didn't really miss that $13,185, which was perhaps the most valuable lesson of all. But enough bragging. Here are some strategies we employed this past year that helped us overcome our credit card debt and finally get a handle on our finances. It's not easy, but it's worth it. This is the number one thing that helped us pay off our debt. I hustled and took on extra freelance work in addition to my full time job. Nathan worked overtime shifts as much as possible. We also had a hurricane and he was deployed for six straight days, helping with relief efforts - bad for North Carolina, great for our wallets. Making more money is probably the hardest advice, because if it was so easy wouldn't we all do it? Still, every little bit helps. I've also found that freelance is much easier when it's not your main source of income. Imagine that. While we almost certainly won't be able to make as much extra money this year as we did last year, we're still working on some side hustles. We're planning a spring yard sale and have sold a few things on Craigslist. We sell our extra chicken eggs for $5 a dozen. I'm always on the hunt for more freelance opportunities. The most important thing to remember is that anything extra you bring in is exactly that - extra. It needs to go straight to debt and not to entertainment, toys, or travel. Once we started using YNAB religiously, I began to see all the ways we were wasting our hard-earned dollars. After a while, cutting our costs became an entertaining and lucrative game. Turning off our AC and opening our windows saves a ton of money. (We're holding out as long as we can - this is North Carolina, after all.) Hanging our clothes out to dry on warm days puts a tiny dent in our energy bill. Riding our bikes downtown or the beach saves on gas and parking meters. Ditching our iPhones lowered our cell phone bill by $30 a month. Developing a deep appreciation for boxed wine (it's actually pretty good) made our booze budget less horrifying. Of course, the only way to cut costs effectively is to understand what you're spending and why. While I clearly love YNAB, any system that keeps you aware and informed will work. So many people don't want to budget because they're afraid of what they'll find. While we definitely dealt with a few frightening moments (the amount we spent on growlers of fancy beer was eye-opening, to say the least) the control you win back is worth it. I was perusing the YNAB fan group on Facebook, as you do, when I came across a discussion on meal planning. As it turns out, many people don't do this. "But how?" I asked Nathan. "How could anyone possibly go to the grocery store without a list?" Leaving my list at home is one of my worst nightmares, and the fact that others willingly do this was hard to believe. So. If you don't meal plan, please start. My system is pretty simple - I keep a small magnetic dry erase board on the refrigerator and jot down what we'll eat each night. Then I buy the ingredients to make those meals. Honestly, it's that easy. As for the actual shopping, I'll admit it: I love fancy grocery stores. Whole Foods, Trader Joe's, that cute little co-op near my office. Unfortunately, the prices are higher in those places and I always blow my budget on spontaneous splurges, like dark chocolate sea salt sprinkled almonds or artisan vegan cheese. A few months ago I started shopping at Harris Teeter and my grocery budget immediately went down. It helps that I signed up for their email newsletter, which sends me weekly coupons based on my purchase history. The coupons are linked to my e-vic card, and I get the discount as soon as they scan it. Which is maybe the most boring sentence I've ever written, so let's move on. Meal planning is also a great way to avoid eating out, which is another money pit. It's a habit we've broken completely (unless it's a very special occasion) and that includes breakfast, lunch, and dinner. Does this get tedious? Of course. Am I bored of our very regular rotation of meals? You betcha. Does eating at home save us heaps and heaps of money? Yes, and that's what really matters. When you're aggressively paying off your debt, the best way to keep yourself from spending money is to never leave your house. That strategy, however, isn't really feasible or fun. Sooner or later you'll cave, fall off the wagon, and find yourself up late at night, ordering a bunch of things you don't need from Amazon for next day delivery. The only way to avoid this scenario is to find inexpensive ways to have fun and be social. We enjoy the outdoors, so camping is one of our favorite low-cost, laid-back things to do. We keep an eye on free events in town and hit them up as often as we can. When we want to hang out with friends, we opt for backyards over bars and board games over... well... whatever it is people with lots of disposable income do. Now that we're in our 30s and most of our friends have small children, hanging out at each other's homes is a lot easier then staying out all night at the bar, which means everyone wins. As a former librarian, avid reader, and writer, I think the public library is pretty much the best thing America has to offer. Reading a book you borrowed from the library is free, fun, and will make you smarter. Sometimes I feel a little guilty that I'm not supporting the publishing industry by buying books, but then I remember that I'm broke and paying off debt, and I make a point to ask for books for birthdays and holidays. If I can't buy them myself, I'll get someone else to do it for me. I also like attending pay-what-you-can yoga classes, my book club, meeting friends for runs or long bike rides, having dog dates and dinner parties, going to the beach, and making an afternoon out of a crafty activity, like canning jam. Fiscally responsible AND delicious! Most of us don't want to admit that we're drowning in debt. We're afraid others will look down on us, judge us, or lose respect for us if they find out the truth. This means we have to maintain the illusion that everything is fine, which too often means spending money we don't have. But illusions are expensive, not to mention exhausting. It's much easier to be honest about your situation, with yourself and your loved ones. Do you think I like admitting that we paid off $13,000 in credit card debt? No, I do not. It's an admission that we racked up that much debt in the first place, which is nothing to brag about. While we were paying off our debt, we were tempted to lie to our friends about why we couldn't go out to dinner or meet them at the brewery. Instead, we told them the truth. And you know what? It was fine. Our friends didn't shame us. Our parents didn't lecture us (well, not much). We weren't ostracized, or made to feel like pariahs, or disowned. No one stopped loving us because of our debt, which was the best lesson we learned along our journey. Today, we have zero credit card debt and a solid plan to keep it that way. All it took was learning how to budget, living within our means, getting creative in our free time, and facing the truth of our finances. (In other words, A LOT OF THINGS.) Needless to say, I'm proud of the progress we've made and excited to see where these hard-won lessons will take us next. I'll be sure to keep y'all updated. PS: Want to try YNAB? Use my referral link and we'll both get a free month! PPS: Why "Do What You Love" is terrible career advice + a review of Big Magic, a great book about living a creative life + How To Start a Book Club.